Telangana became the first state in the country to have its own e-wallet. 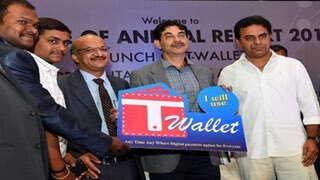 The IT Minister KT Rama Rao launched T-Wallet here on Thursday offering anytime anywhere platform for digital payments with no additional charge for the citizens. Using this platform, the citizens not only can make payments to government and private organisations towards various services but also receive the benefits from government like pensions, scholarships and MGNREGS wages. The digital payment option will be available across formats such as online web browser, smart phone, feature phone and even without a phone. Hyderabad based startup Transaction Analysts has partnered with Telangana to develop T-Wallet which uses two factor authentications, through Aadhaar plus Biometric or Aadhaar plus OTP to Aadhaar linked mobile number, for feature and no phone users. The digital payment service startup, aims to achieve financial inclusion and increase user transactions based on Aadhaar, with or without the need for a bank account. Supporting Telugu, Urdu and English, the wallet is created on Azure platform and designed for scalable performance with enhanced security. Srinivasa Katuri, CEO, Transaction Analysts, said that one can use T-Wallet platform, irrespective of whether he has a bank account or not. K. Ramakrishna Rao, secretary, finance, government of Telangana, said T-Wallet would help bring governance closer to people by providing services in remote areas, where there are no bank branches. Telangana Launches E-Wallet For Digital Payments 0 out of 5 based on 0 ratings. 0 user reviews.